Sleepy parents need coffee to function, and baby strollers need two hands to keep moving in a safe, straight line. So when a sleepy parent takes their morning coffee for a stroll with baby, they're gonna need some help from the Babyhome Cup Holder stroller attachment. Designed to fit the Vida, Vida Plus, and Emotion strollers, the Cup Holder attachment snaps onto the frame of your stroller so you can take your coffee on the go and keep both hands on the handlebar. The Cup Holder attachment is made from strong, durable plastic materials that will hold any amount of coffee, tea, soda, water, etc. that you require to power your day. The upper edging of the holder is lined with gripping material that conforms to your drinks no matter their size, and holds them tightly in place. Your large, hot coffee will stay upright and stationary as you stroll, and your little one will remain safe from spills and splatters. Pop on the Babyhome Cup Holder stroller attachment and take a morning stroll with both your little one and your morning coffee in peace. 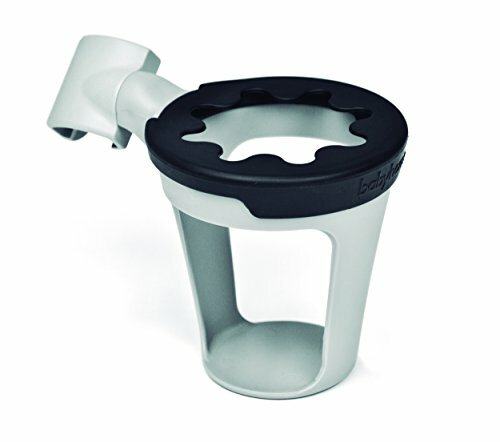 COMPATIBLE: The Babyhome Cup Holder attachment is compatible with all three Babyhome stroller models. Fasten it to your Vida, Vida Plus, or Emotion stroller with the strong clamp and take your coffee and tea to go. STRONG AND DURABLE: Made from durable plastic materials, the Cup Holder stroller attachment is built to hold your heavy travel mugs. The strong clamp fastener holds tight to the frame of your stroller and keeps your drink stationary and upright. TIGHT GRIP: Around the top of the Cup Holder is a special edging made from gripping materials that will hold your travel mug, bottle, or soda can tight, and prevent your drinks from spilling all over your little one in their seat. EASY TO INSTALL: Designed for the sake of simplicity, the Cup Holder stroller attachment is easy to install. A small arm reaches out from the side of the holder and clamps onto the frame of your stroller with an easy snap. GREAT FOR DRINKS OF ALL SIZES: Whether you're carrying a travel mug, a large coffee from the local cafe, or a can of your favorite soda, the Cup Holder stroller attachment will hold it tight. The grip edging conforms to drink sizes big and small, so you'll always have an extra hand to hold your beverage. If you have any questions about this product by Babyhome, contact us by completing and submitting the form below. If you are looking for a specif part number, please include it with your message.